The phonograph, the talking machine, is no longer a mere mechanical instrument but a reproducer of sounds. They are among the items chosen for you and some are offered for their beauty and/or rarity. The beginning of the phonograph began, like many items on this website, at the end of the 19th and beginning of the 20th centuries. The inventor, Thomas Edison, was responsible for many discoveries during this period. And let us not forget two Frenchmen, Scott de Martinville and Charles Cros, who participated in this great adventure of modern communication. 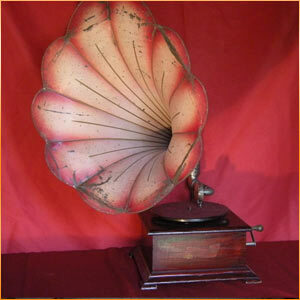 A phonograph should be in good condition and in working order. Next, we have the prestigious machines, collectors pieces almost impossible to find such as Bettini, Lioret, certain Edisons and Phrynis’, and others whose estimates can be astronomical. We are at your disposal to guide you in your search and to answer any eventual questions.